I make Crock Pot Picadillo all the time in my house (Madison’s number one request), and because it makes so much I like to get creative with my leftovers. 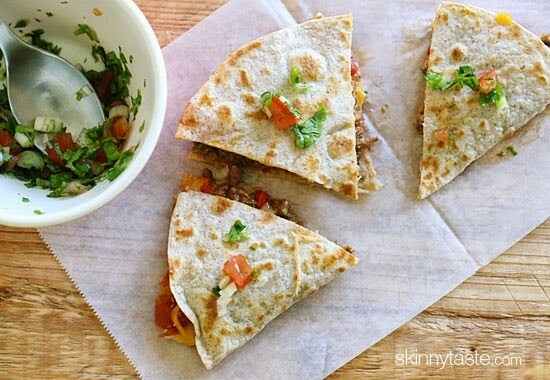 I came up with this quesadilla for lunch one day and my husband said I should put it on the blog, so I thought with Cinco De Mayo coming, it would be fun to do some Cuban-Mexi fusion. I made a really quick & easy Pico de Gallo to add along with the cheddar jack cheese, the results – delicious! Combine the ingredients for the quick pico de gallo in a small bowl. Heat a nonstick skillet over medium heat. Spray the skillet with oil and add a tortilla. 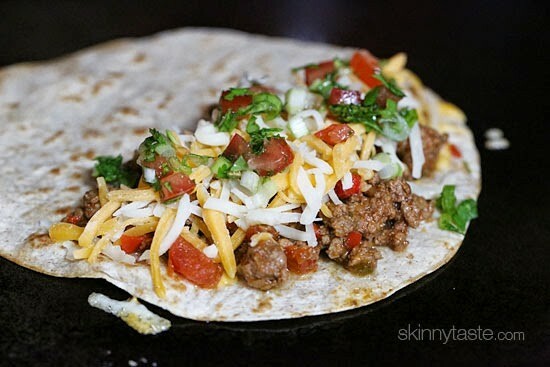 Brown about 2 minutes on each side, then spread 1/4 cup picadillo on half of the tortilla. 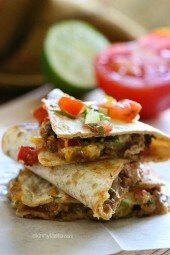 Top with cheese and half of the pico de gallo, then fold and press down with a spatula. Cook 1 to 2 minutes on each side, until the cheese is melted and the tortilla is crisp. Remove from heat and cut in 3 pieces. Repeat with the remaining. Eat hot! The pico makes this! I had it first without the pico, and it was good, but nothing spectacular. I made the pico the next time, and it was yum!! OH MYYYYY! Such wonderfulness (not a word) These are FANTASTIC!!!!!!!!!!!!!!!!!!!!!!!!!!!!!! 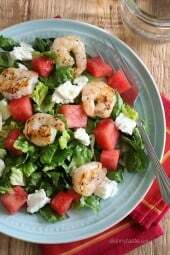 Thank you, Gina… You have made it SOOOOOOOOOOOOOO nice to lose some pounds and eat healthy….. These seriously ROCKED…. We had these last night – they were so delicious! Even my picky 2 year old ate it (with sour cream)! These were phenomenal. I added some of the olive brine. Used a regular onion since that is what i had for the pico de gallo. Perfect! Using the leftovers for tacos another night this week. Excellent! These were easy and amazing!! I love left over recipes and I still have more Picadillo left so I will definitely be making this again! I don't see where the question of how big the tortilla is that you used in the recipe, Gina. I do not have La Tortilla Factory in my grocery so I need to know how big the tortilla is in inches. Thanks! Gina, this was FANTASTIC!! Even my picky six year old ate it and absolutely loved it. Thank you so much for a winner that the entire family will eat. 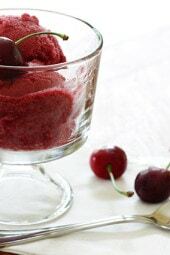 This recipe is really wonderful! So tasty and awesome that you make the Picadillo ahead of time! YUM! I've used my leftover picadillo in omelets… delicious! This looks super yummy, but I am a little confused…there appears to be ground beef in the pictures, but no mention of ground beef in the ingredients. 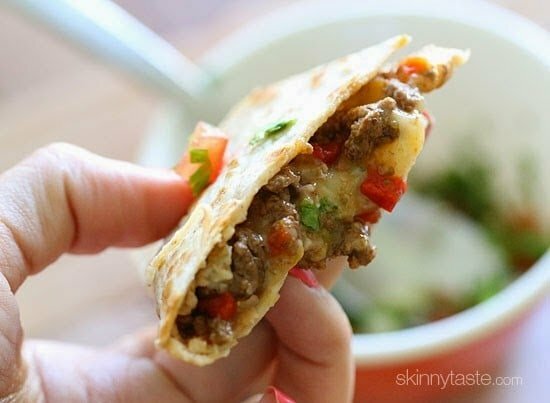 A Latin American and Caribbean favorite, picadillo is a savory-sweet ground beef filling that's … It's also good in tacos, quesadillas, and omelets. I made these last night for dinner and they were so yummy! The recipe for Picadillo tastes much better than the taco mix added to ground beef (what I usually make for quick taco dinners). I'll use your recipe from now on!! Much healthier too! Thank you! Are the points calculated with the La Tortilla Factory Large Size or Original size reduced-carb whole wheat flour tortillas? 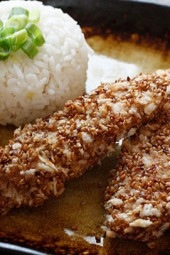 I am definitely making this tonight but will be using ground turkey instead and adding beef flavored seasoning. I also can't have the cheese so I'm going to try using avocado for some creaminess. btw I'm new to your website and I absolutely love love it I will be using these recipes for years to come!! Sorry it's fixed, but anything can be found using the search bar for the future! The serving is one tortilla, but since the recipe calls for it be folded over, one serving is the three triangles. Yes, the recipe link is broken. I'm sure she'll fix it but in the meantime, you can type 'picadillo' in the search bar (top right) and the link WILL come up. She has both a crockpot and a stovetop version on the blog. This looks amazingly delicious!! Think CP Picadillo is a must this week! Looks great! I use my leftover picadillo to stuff sweet potatoes. They are awesome. You can also do empanadas, and other Latino dishes if you are so inclined. 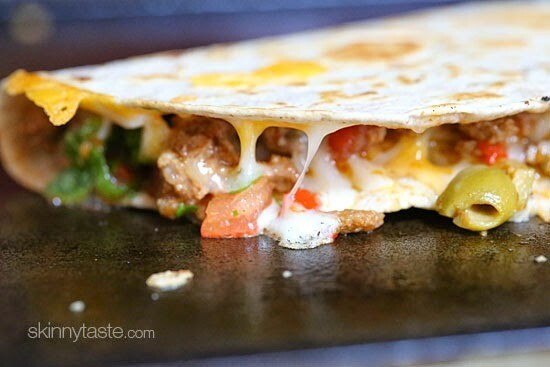 Is the one quesadilla the entire tortilla or one of the 1/3 sections? it's one whole tortilla, folded in half so you get all 3 sections. Link in the recipe is broken. If using leftover picadillo, do you need to reheat it from the fridge, or will it get warm enough while the cheese is melting (without burning the rest of the tortilla)? Yes, I like to warm it up first. Click on the "crockpot picadillo" recipe for the meat portion. Looks easy and delicious! You have to look up the picadillo recipe to get the meat part. Is it just me or is there meat in the pictures, but none in the recipe? The link is broken, would you mind re-posting. Thanks. Yes, I was thinking the same thing. There looks like there's ground beef. Is that included in the calories? I just fixed the link, sorry! And yes, that is all calculated into the calories. Looks amazing. What size brand or size tortilla do you use to compute the points? I used La Tortilla factory to calculate. I found La Banderita brand of corn tortillas ans they are 2 points for 2 tortillas & are 5 1/2 inches!! We don't have that brand. Is it an 8 or 10 inch tortilla?